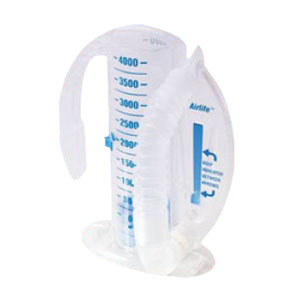 AirLife™ volumetric incentive spirometer simplify deep breathing therapy with an intuitive design that prompts patients to correctly perform and monitor their own breathing exercises, even without direct supervision. A patient goal indicator can be adjusted and allows patients to monitor their own progress. Dual-sided calibrations clearly identify achieved volumes of up to 2500mL capacity. The flexible tubing lets the patient adjust the mouthpiece for use in various positions, and a mouthpiece holder provides storage when not in use. Patient goal indicator can be adjusted and allows patients to monitor their own progress.